Intro: Exploding onto the national scene way back in 1988, Buffalo Tom has won both commercial and critical acclaim and is still very much a force to be reckoned with. While many Boston bands of that same era (The Pixes, Letters To Cleo) have imploded or gone off on musical experiments that were best left back in the basement, Buffalo Tom continues on with all the original members, not hiding their previous influences (Husker Du, Dinosaur Jr, The Replacements) but creating a sound that is uniquely their own. Along with singer/bassist Chris Colbourn and drummer Tom Maginnis, lead singer/guitarist Bill Janovitz has helped to keep each new release fresh and exciting. When you hear that first guitar chord, or a great harmony vocal between Bill and Chris, followed up by an inventive drum fill by Tom, you know this is a Buffalo Tom song. And you “go rolling in the moment” (as Van Morrison would say). To celebrate the recent Buffalo Tom “Besides” (Beggars Banquet) CD and Bill’s second solo CD “Up Here” (SpinArt), I was able to catch up with Bill and talk about his music and other topics of interest. EC:	When did you first start playing music? Was guitar your first instrument? Bill Janovitz: I had taught myself some "chord organ" around the house as a very little kid but trumpet in fourth grade was the first real instrument. I kept up on it and was pretty good at it until I picked up guitar around sixth grade. I lost interest in the horn. I wish I hadn't and lately I have been keeping an eye out for a used one to maybe see if I still have some lip left. EC:	What kind of music were you listening to or were exposed to when you first started playing guitar? Bill Janovitz: I was listening to a lot of southern rock and classic rock around 12. I am the oldest so I never had any older siblings to turn me on to records. My parents had a few interesting things like Elvis. But the big influence were some British-born teenage neighbors next door who gave me a boatload of British invasion and folk rock 45s along with some classic Stones and Dylan mono LPs, which I still own. I was really into that stuff by the age of 8 or 10. Soon after picking up the guitar, 12-14, I was getting into Talking Heads, the Clash, U2, Elvis Costello, etc. I grew up on Long Island, which was very conservative musically, but we had NYC stations playing some good stuff mixed in with the bad. Actually, there was a great Long Island station, which was then called WLIR, a pretty small progressive commercial station. I got very into old blues via an older guitar player in the neighborhood and a guy on the Stony Brook University radio station that had a great blues show. I still have some cassettes I made of his shows. We loved loved loved Neil Young and the Stones in my first band - age 13 or so. And via the Stones, we got into the old blues guys and roots of some of the British invasion stuff, like John Mayall and the Bluebreakers. EC:	Can you briefly describe your involvement in music up until the formation of Buffalo Tom? Bill Janovitz: Well, from that band on Long Island, I moved to Medfield, a small town in Massachusetts when I was 16. Very hard to do. Hated life for a while, until I found some great new friends but particularly musicians. We kind of kept up the same track of mixing classic rock covers with new bands' material like the Police, Costello, Clash, Joe Jackson, etc. I started to write, mostly joke punk songs, some angst-ridden jangly stuff, some ska. I remember seeing REM open for the English Beat in '82 and that was a hallmark for me. Anyway. these bands were always changing personnel and soon I found myself singing out of default. So I started writing more seriously and taking it even more seriously than I already had; it was what I wanted to do with my life. Then came college and soon, Buff Tom. EC:	How did you meet the other members of Buffalo Tom and how did the band come to be? Bill Janovitz: I was friends with guys a year ahead of me who went to UMASS while I was still in high school, so I would always go up and visit them in Amherst during my senior year. I loved it there. I met Chris and Tom through them. Chris was from the same town but was two years ahead of me so I never got to know him in Medfield. I knew his girlfriend, who was in my class. I think I knew Tom a little better at first, oddly. They were both playing in bands, Tom was playing Boston clubs by the time he was 17 I think, playing bass in this great band called Plate of Mutton (nee Schuyler Hinkle). They played almost all original stuff, sort of the Cure meets Mission of Burma, with Tom's cousin Phil, a great singer with a voice like Ian McCulloch. I loved them. Chris played guitar in a great party band up in Amherst that played an eclectic setlist. I would sing a few songs sometimes. Stooges, Gun Club, Bauhaus even! EC:	Was it true that you all started guitar in the early days? How did you resolve who would be "the frontman"? Bill Janovitz: So I had a bunch of songs written and was the only singer at the time, so it was natural I should play guitar, though we intended to switch around a lot. But Tom, after already switching from guitar to bass in his other band, really relished learning to play the drums, even though he was far too good-looking to be confined behind the set that we borrowed from J. Mascis, who was a friend and schoolmate. Chris was less enthralled at the idea of playing bass, I think, so he ended up playing it like a low guitar, which is what it is anyway. It kind of was what happened with Dinosaur as well. So we had all kinds of reasons for sounding alike: similar dynamic and influences, and we loved their records. EC: Looking back over the Buffalo Tom catalogue, it seems that each release expanded on themes from the one before-is that the most important goal as musicians when you go into the studio to cut a new record? Bill Janovitz: Sort of. Not so much as musicians, but as writers and producers; we did not want to repeat ourselves sonically or as far as material. We wanted to grow, expand, sure, and keep finding our own collective voice. 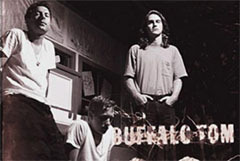 EC:	What recording session was the most rewarding for you with Buffalo Tom? Bill Janovitz: I think each was almost equally revealing. But nothing takes the place of that first recording in a real studio with sympathetic engineers/producers. Going into Fort Apache and being recognized as a real band along side or in the same context as a lot of our immediate Boston heroes was a great thrill. Getting those huge sounds down on tape, even if a bit murky, was exciting. Those Fort records with Mascis, Tim O'Heir, Sean Slade, and Paul Kolderie were all so much fun, though not without their drama and arguments. The Robbs were very educational and encouraging on Big Red Letter Day and we spent two months in LA, which was grand and depressing at the same time. EC: Is there one CD you would look back at and say-this one really works from start to finish? Bill Janovitz: Well, I really do not sit back and listen to them front to back after the mastering process is done for each. I think the only one with real clunkers that I do not like is Birdbrain, which also has a high quotient of my favorite songs on it. We were just experimenting with things that did not work in the end, I think. So in my mind at least, I think they are all solid for what they were/are. But I think of it as all one long continuum; it is like baby and childhood pictures; you don't prefer one era of yourself over another - its all you, good and bad. EC:	Do you ever feel pressure to play songs that people know the most? For instance, I saw The Church about two years back and they played half of "Starfish". When I saw Paul Westerberg a couple months back he dipped into "Pleased To Meet Me" pretty heavily. Even when I saw Buffalo Tom on the "Smitten" tour you Played half of "Let Me Come Over" (not that I'm complaining). Is this just more a case of here's some of our best work-let's present it? Bill Janovitz:: Not sure if it is the best, but it is the album that resonated with many of our fans. It was the year it came out almost as much as what is on there; kind of a zeitgeist thing in a small way. But your point is valid and I think of shows not as so much an artist as an entertainer. I am not a jazz performer creating onstage; I am presenting the art I created in private situations, alone and with the other BTs. I don't want to perform stuff people don't want to hear. I am not there to force stuff. But I don't want to just play singles either. Most of my favorite Stones and Neil Young songs are not singles, but album tracks and ballads. I feel we should do our best to balance the old, new, obscure, covers, hits, etc. I am all about the balance, baby. EC: What's the biggest audience you've played to with Buffalo Tom? Bill Janovitz: Probably the Reading Festivals or other Euro-fests like Roskilde. EC: Do you have a best and/or worst concert experience over your career? Bill Janovitz: The worst involves a physical attack by a French skinhead chick in Paris. That might have also been the best. Usually the best are when we are all clicking in a great sounding room on a great sounding stage to a good audience with energy and appreciation. Boston, NY, Chicago, London, Sydney, San Fran. - these are some of my favorite places to play. EC: What was the best tour that you can recall doing and what other bands were with you? Bill Janovitz: My Bloody Valentine, BT, Yo La Tengo/Mercury Rev (latter switched halfway through). I also loved touring Australia with Superchunk. EC:	How big was the check to allow "Sodajerk" to be in that Pontiac car ad? As	big as Madonna's for Microsoft? Bill Janovitz: Yes, we have a favored nations clause that matches everything with Madonna's peaks…ahem. Sorry for the pun. EC:	After a recent series of Buffalo Tom shows to support the "Besides" CD, you stated that no one in the band was "giddy as schoolgirls" to get back together full time. Is that still the case? Bill Janovitz: I still have not sensed any giddiness, but there never was. It was kind of a joke, but the point is that we have not talked about it much yet, and maybe no one is picking up the charge for it yet. We are all in some transition spots in our lives. We will most likely do another, I sincerely believe. EC: In 1996 you put out your first solo CD-"Lonesome Billy". I really enjoyed it because you went so off on so many musical tangents that we had never heard you do in Buffalo Tom. From a country shuffle on "Strangers" to a cool version of "My Funny Valentine". What was your objective with the songs? Bill Janovitz: You took it in the right spirit, that of a fun side project, a diversion, tangents as you say. I really wanted to play with other people. The last solo record Up Here was far more focused and serious as a "real" solo effort. EC:	In 2001 you released "Up Here". It seems to be a more connected release. The songs are in a similar acoustic/folk range and all the lyrics create an almost "Storytellers" type atmosphere. Did paring back to strictly acoustic change the recording feel for this CD? Bill Janovitz: Change from other records or Lonesome Billy? I think the songs were meant to be played like that all along, so it did not change the mood there. I had the material and mood in mind when I set forth on it. And yes I did want it to be very different and far more intimately personal than the band records, which are at turns both personal and intimate in certain moments. But I wanted to be solo singer-songwriter for a while and still love to do that. EC: I think the songwriting on "Up Here" is really excellent. I know that you joked at a recent solo gig that some of your songs were ripped off from classic rock artists (don't worry I won't name names). But although sometimes I feel that your influences are there, but are more subtle-underneath the surface. As opposed to someone like Ryan Adams for example, where I can listen to him and go: Van Morrison, Counting Crows, Paul Westerberg and so on. Who have you been listening to lately? Bill Janovitz: Thanks. I think Ryan Adams, who has some excellent moments, is still a little bit younger than I am and will probably go on to find his own voice and write a masterpiece. I have not heard much of his latest record but thought it sounded like a step back from that direction of his Heartbreaker (is that it?) record. I think the Westerberg solo record Stereo is as good as anything he has ever written and was so excited about it. I have not been as up on some brand new stuff lately, mostly listening to older writers and older records. But I like some Promise Ring, Mogwai, Coldplay, Mercury Rev, Wheat, Sparklehorse, White Stripes. EC: Do you think being on SpinArt has helped your solo career head upwards? Their roster is geared to singer/songwriters as opposed to nu-metal angst rants heard on the radio now. Bill Janovitz: Every label has plusses and minuses. Not sure if being associated with them in general has done more than make people take a slight notice at the association. They have a great publicist. EC:	How has the music scene changed since you first started? Bill Janovitz: Which scene? I mean, it really depends on what specifically you are asking. The mainstream rock scene went from bad (80s) to better (92-94) to bad (quickly) to worse to slightly better lately. But there has almost always been interesting stuff going on underground and on small radio stations. Now the Internet allows some access to interesting things and bad major labels and bad radio stations can cry all they want; they dug their own graves. EC:	Are their any artists that you would like to record and/or write songs with that you haven't got a chance to at this point? Bill Janovitz: Keith Richards/Jagger, Bob Dylan, Van Morrison, Tom Waits, Costello. EC:	What's the story behind Crown Victoria. How did that project come about and will there be a CD release soon? Bill Janovitz: Well, it went from being a solo guy and his backing band to a real collaborative band in and of itself (which is why I did the separate solo LP) and is now sort of an extension of my solo thing, though a collaboration nonetheless. I just lead it. We have a bunch of things recorded that we need to mix and will have out in the next 6 months. EC:	How many guitars do you own and what are your favorites to play? Bill Janovitz: Probably 5 electrics and 3 acoustics Love the SGs for electric and the Guild for acoustic. EC:	Are there any songs that you never get tired of playing, no matter how many times you have to cart them out live? Are there some you would like to retire? Bill Janovitz: Yes and yes. Former: Mineral, Larry, Rachael, Summer, Allowed, Birdbrain…many more. Latter: Sodajerk is the one that springs to mind. Taillights is probably in the former, but may be in the middle somewhere. Thing is, when I play them and people react, it does not matter how I felt beforehand, I almost always get way into them. EC:	What do you do for fun when you are not working on music? EC:	Are there other mediums (movies, books) that have an outside influence on your music? Bill Janovitz: I Both mentioned very much so. Overheard conversations, other peoples' relationships, paintings. EC:	What else is in the future for you? Are you still scoring the Mike O'Malley play or have some other projects come up? Bill Janovitz: I I have a great new musical project with Graham Parker and some other folks -- that I am not yet supposed to detail. I am very excited about it though. No scores beyond the first one yet. EC:	Thanks again for taking the time to talk with me. We're all looking forward to your next musical endeavor-whatever it may be. Bill Janovitz: I Thank you!